When reviewing some earlier DVDs in this series I said I needed a cup (or was it a mug?) of Earl Grey tea and a bun to complete my indulgence in an afternoon’s enjoyable marquetry tuition. If that form of rating was used as my yardstick, then I would certainly say this new and latest disc from, not only a master marquetarian, but seasoned tutor into the bargain Peter White, should certainly command two large Bath buns, two mugs of Earl Grey tea and a generous slab of fruit cake to complete this full visual and educational marquetry feast! 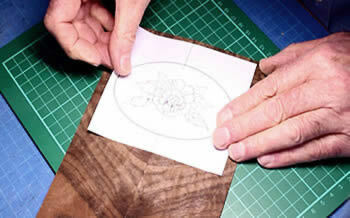 This new tutorial DVD covers the techniques required for adding artistic elements and presentation to your marquetry. 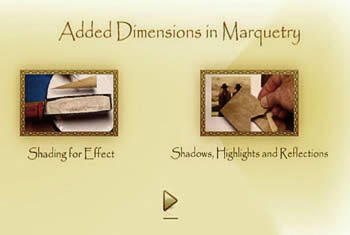 The DVD is titled "Added Dimensions in Marquetry" and it demonstrates how to go about adding a degree of photo realism to your marquetry project. Marquetry is generally an artistic medium that produces work with a rather flat presentation unless specialist techniques are applied to add depth and roundness to the work. 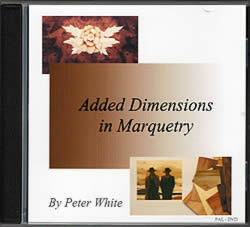 Peter's new DVD delves heavily into these skilful arts and shows you how to apply them to your own marquetry work. Although you all know about the technique of sand shading (or scorching) - how many of you actually know how to use the technique to best advantage? Peter, of course, is a master of the sand shading art, and in real time, Peter demonstrates how to sand shade veneers with almost clinical precision. No need for gas rings, hotplates or pans full of hot sand - Peter's inventive sand shading tools demonstrate how unobtrusive a custom built sand shading rig can be. 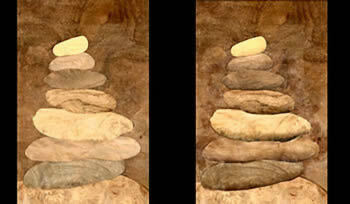 The before and after screen capture on the left demonstrates what useful effects can be achieved when sand shading is appled correctly. No sign of burnt veneer here, just a delicate transition from light to dark in the shaded area. It adds the shape and roundness we talked about earlier. You can easily see the flat looking marquetry on the left before sand shading is applied, but once the technique has been applied, look at how much more convincing the marquetry becomes as seen in the picture on the right of our screen shot. Book matching veneers and applying decorative designs are covered here. 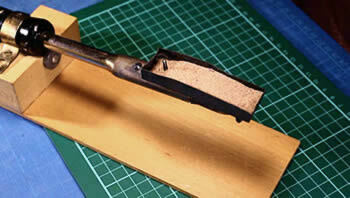 Especially when related to producing beautiful caskets and jewellery boxes. 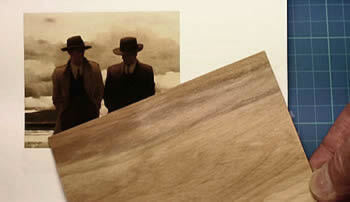 And, when you want to select some veneer for a new project, what do you look for? Do you just follow the basic recommendations such as Aspen for sky, Magnolia for floral work, Pear for portraits, etc? With this tutorial DVD Peter shows you how to choose the best veneers to give artisitic effects to your marquetry project. Much more than is outlined in this review can be found on this DVD. We have only covered a small handful of examples of the tutorial advice to be found on this disc. The pictures seen in this review are all genuine screen captures taken directly from the DVD. It plays with excellent HD quality on normal DVD player and TV set ups. Also runs happily on computers with DVD drives. We have even run it on the latest Blu Ray players and 4K Ultra HD TVs and had perfect results in those systems. If required the DVD can be formatted for the USA NTSC system. Please specify if wanted. This DVD would make the perfect Christmas gift for the Marquetarian in your life, it really is that good! For Marquetry Society members who wish to purchase and pay by snail mail and cheque/check, please refer to the payment methods as outlined on page 48 of your current Marquetarian magazine.